How does your business protect itself from cyber security threats? The internet has never been more helpful for businesses in expanding their market and increasing efficiency. Cloud computing, online shopping, and the websites and email we take for granted are all critical to business success in the digital age - but with each innovation comes new security concerns. All businesses, from sole proprietors to global companies, must protect themselves and their customers from cyber security threats. 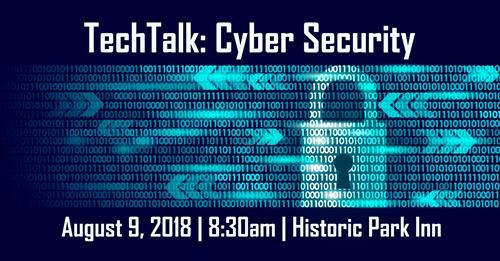 Join us at TechTalk for a free Cyber Security seminar, led by Iowa's experts. Our speakers will share their real world experience and practical tips on how to protect your business. TechTalk Sponsors: Ag Ventures Alliance, Clear Lake Bank & Trust Company, CL Tel, DealerBuilt, Kingland, and Metalcraft Inc.
Free. Seats are limited - Please register on EventBrite to confirm your spot.